I have fallen in love with collagraph printmaking. This unique process produces both a print and a relief. A hard base, like pressboard, is used to glue down objects such as cardboard, string and fabrics to create a design and a texture. I like to use mainly torn matte board and construction paper. A polymer acrylic medium is used to glue and seal the textured objects to the base board. Once the collagraphic plate has dried, it is ready to make a print. Etching ink is used to ink the plate. My method is to apply black ink with a cotton rag and a stiff brush. Mineral spirits is used to dilute the very concentrated ink and help spread it across the plate. Inking the plate is very important. How thick the ink is applied and where it is rubbed away or left in the cracks effects the final print. While the plate is being inked, heavy printing paper is cut to the correct size and soaked in a water bath. To make the print, the inked plate is set on the press and the blotted printing paper is dropped accurately on top. The plate and paper are sent through the press at a moderately tight setting. The correct press setting both transfers the ink and creates a distinct relief. The print is lifted off the plate and set aside to dry. I choose to add color to the print by use of water colors and colored pencils. The plate is permanent and can make multiply prints. 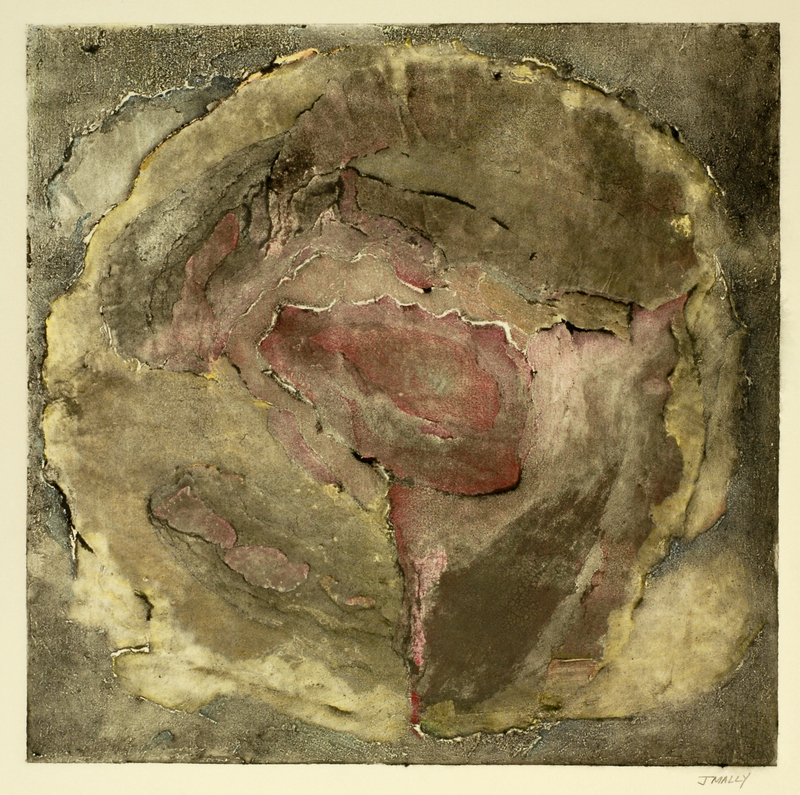 Categories: JMally Artwork | Tags: art press, collagraph printmaking, etching ink, relief printmaking | Permalink. Last year I was given the opportunity to fire my work in an Anagama kiln. David Smith, a professor at Edgewood College is an expert in the building and firing of these unique kilns. Anagama kilns are an ancient style, wood fired kiln originating in China and later brought to Japan where they were used to fire tea ceremony ware. The Anagama kilns I have seen are about 20 feet long and have a main firebox at one end and a chimney at the other. Along the 20-foot body are stoking holes where wood is placed during the firing. The green or bisqued ceramic pieces are loaded into the kiln on shelves. A carefully planned path for the air and flames is important to ensure good firing. The wood fire process produces a wide range of beautiful surface effects due to exposure to fly ash, added salts and the effects of the flame. The kiln is fired 24 hours a day for up to a week to reach temperatures hot enough to vitrify the clay (2500 degrees). I love the concept of ‘community’ in art; creating pieces that relate to each other. For the last firing, I created a set of abstract figures of different sizes and varying gestures. The pieces are free-standing and can be moved in relationship to each other. As each figure is moved into relationship to another, different emotional dynamics are created ranging from intimacy to abandonment. Categories: JMally Artwork | Tags: Anagama Kiln, art in community, Figurative sculpture, wood fired ceramics | Permalink.